A new year, and a new character write-up: Chthyra, the Crawling Chaos, with an illustration by Dan Houser. Chthyra is a psychic parasite from a reality in close proximity to our own which travels to our reality in its astral form. As such, it does not have a physical form in our reality. When Chthyra manifests in our reality, it usually takes the form of an oily black-skinned humanoid, a shapeless mass of hairlike tendrils of darkness, or something in between the two…. Just a quick update. Bulletproof Blues Character Sheet Helper is done, and we have uploaded the first of the sample characters: Karen X, the evil counterpart to the heroic (or at least non-homicidal) android Karen 7. Great news! Artist Dan Houser has completed all of the character illustrations for Bulletproof Blues. This freaked out maniac is TickTockMan, the master of time. Like all of Dan’s artwork in Bulletproof Blues, this illustration of TickTockMan will be available on DriveThruRPG under a Creative Commons Attribution-ShareAlike license after the book is published. 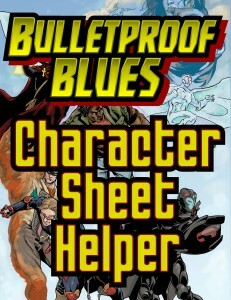 Speaking of characters, we are currently putting the finishing touches on the Bulletproof Blues Character Sheet Helper. The Character Sheet Helper makes it easier to write up your characters and share them. In addition to just helping you write up your Bulletproof Blues characters, the Character Sheet Helper has outputs for text (to paste into emails), wiki (to paste into articles on the Kalos Universe wiki), and print (to print out your characters for easy use around the game table). And it’s free, of course.